The more I saw of the place, the more it seemed entirely appropriate. 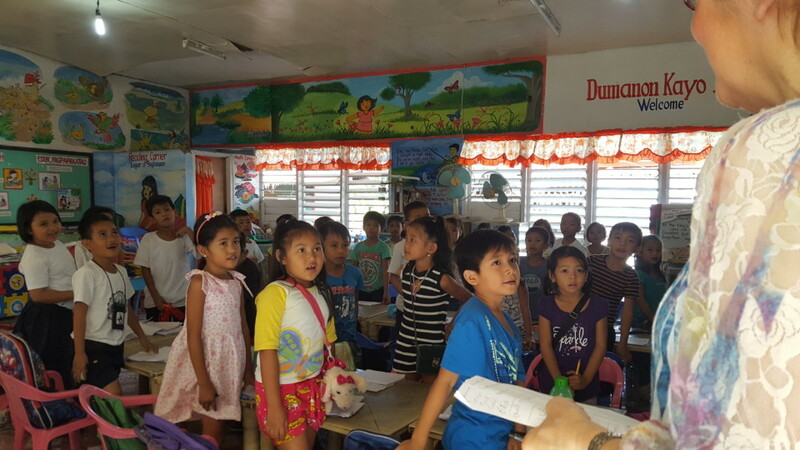 “We teach livelihood and literacy which creates a globally competitive child”, said Delia Domondon Ordanza, a co-ordinator and teacher for the “Alternative Learning School” (ALS) and special education sections of the school. 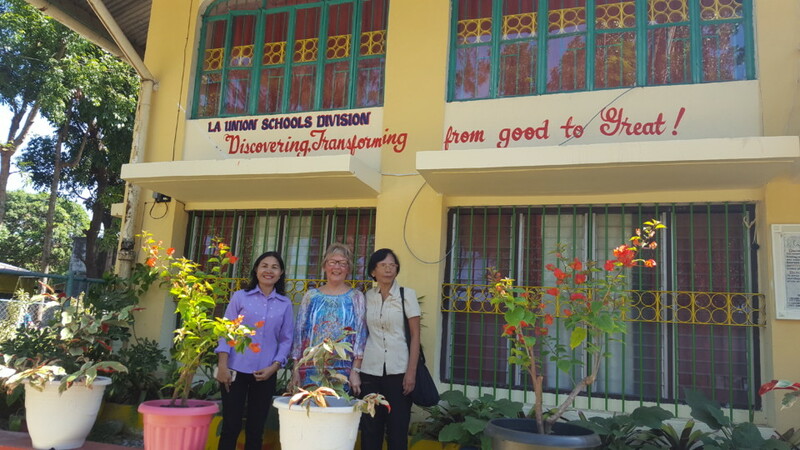 The school principal, Dr Marietta A Villena, is something of a visionary, who is working hard to create the best educational establishment in the province of La Union. Dr Villena was recently named as “the most outstanding principal in La Union”, while Mrs Domondon Ordanza was feted as being “the most outstanding ALS district co-ordinator” in the same year. Visiting the school, it’s immediately apparent how well-deserved these awards were — the two women’s vision and philosophy take a very real and practical form here. When they arrived, ALS children were being taught outside in the shade of some trees. This was brought to the attention of local government, and after much arm-twisting (and personal investment) dedicated classrooms were built. In the special educational needs part of the school, which is a separate unit, pupils range from age from five to 28. The school has 1,033 regular students and 32 teachers. In the ALS section, there are 108 special education and 102 in the alternative learning centre. Children in this part of the school suffer from a variety of conditions including autism, visual impairment, deafness, cerebral Palsy, Downs syndrome and ADHD. The severely autistic pupils are separated in cubicles and attended by trainee teachers who are overseen by trained teachers. I was impressed by the one-on-one attention for these children who, although being in these cubicles, were still very much part of the class. I was also impressed by a teacher I saw at work, Leah Buenoventura, who had taught herself sign language. Although she had a full university teaching qualification, she had chosen to go that one step further to help her students. The children were incredibly well mannered at the school — signs reminding them to “always say thank you”, and the like, hardly seemed necessary. Flowers lining all the pathways created brilliant splashes of colour throughout. The school promotes recycling to a high degree and has an highly impressive organic vegetable garden. 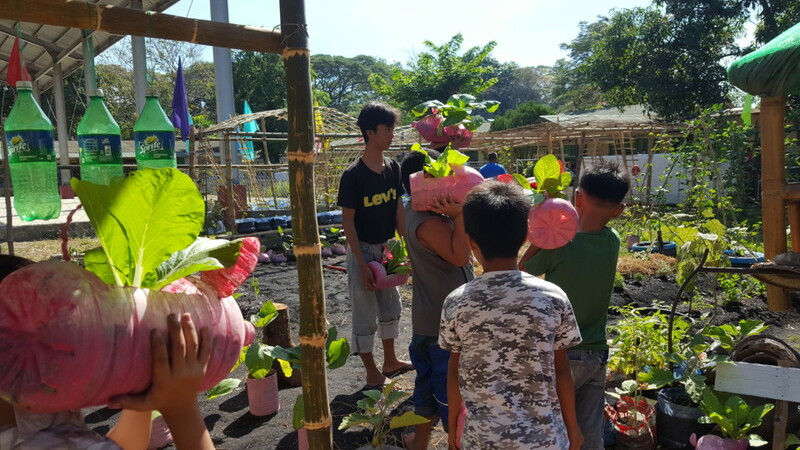 While this is overseen by teachers the children are enthusiastic vegetable growers (tomatoes, radishes, green beans, strawberries, herbs and more) which start their lives in recycled plastic bottles. 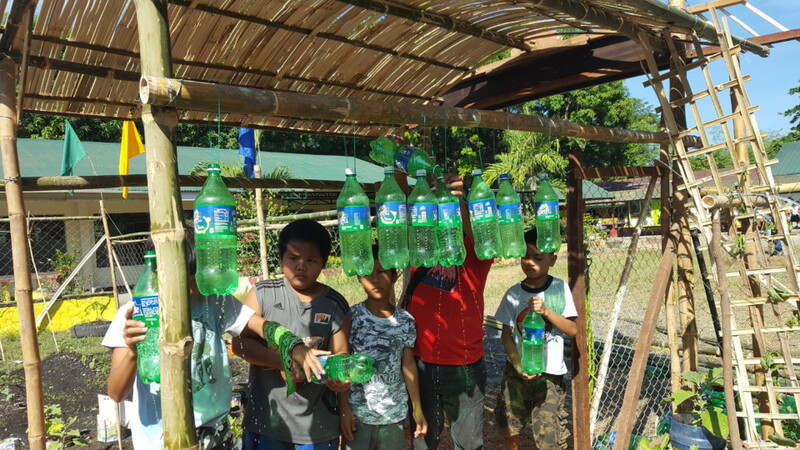 Recycled bottles are also used to create a very clever sprinkler system. Food from the garden is eaten at the school — particularly important when you consider that 33 pupils have been assessed as severely malnourished this year. Happily, this number has now been reduced to 10. “From the time children start school at age three or four, they are taught life skills. If you walk into the infants’ classroom in the morning you will see them cleaning their room. 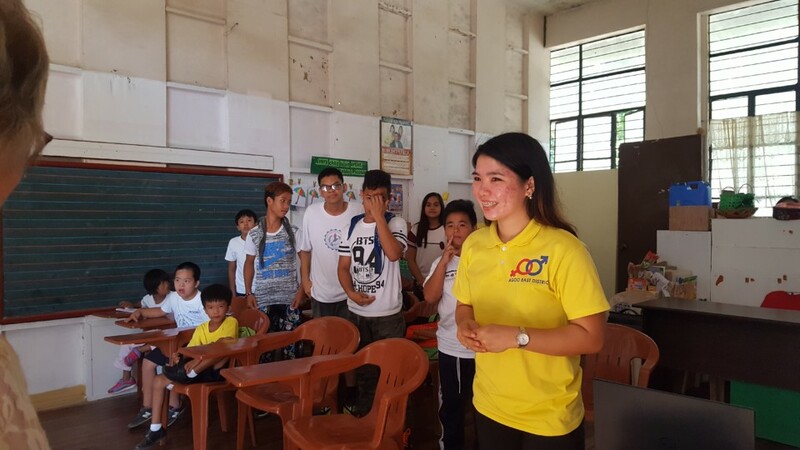 We teach them how to set a table, tie their shoelaces, about hygiene on multiple levels so they can go home and teach their families,” said Mrs Domondon Ordanza. All their shoes were stacked in neat rows, providing charming evidence of how successful this policy is. Also, in every classroom we entered, which was most of them, the children rose as one to say “good morning and thank you for coming”. There is also some serious talent being nurtured at the school. Three students are preparing for the Metrobank Math Challenge. The children, aged nine, are Irish Moniques Estoque, Nehemiah Paul Ballecer and Paolo Joaquin Fiesta and I watched as they sat together at an outside table preparing for the big day. The children also shine at sport, and are provincial and regional champions in the martial art of Tae Kwon Do. In the principal’s office there is a shelf full of trophies won by the school for other sporting achievements including basketball. In spite of what I am now. 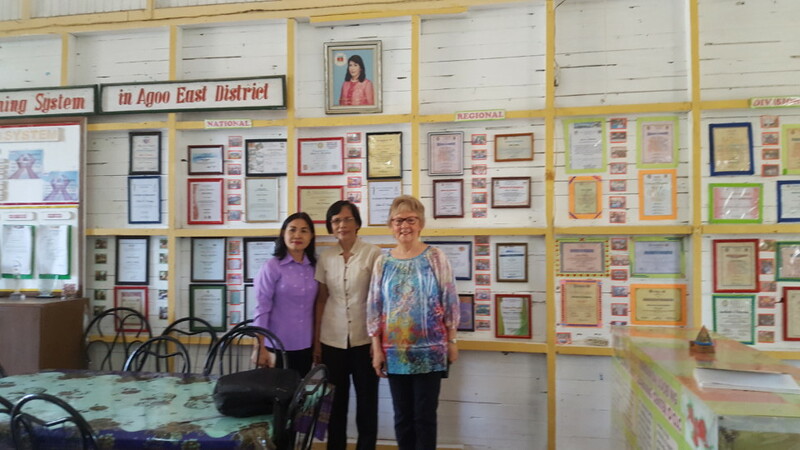 My day at the Agoo East Central School was inspirational and informative and is the embodiment of the old adage, “where there’s a will there’s a way.” With Dr Villena at the helm — with her expectations of excellence — this public school in provincial La Union will continue to give young people the very best start in life.